How do I remove password checking on my screen saver? When I move my mouse to quit my screensaver my computer’s login screen appears and I have to enter my password to use the computer. Is there any way to turn this off? Sure, but the first thing you need to realise is that the password is there to protect your computer. If other people have access to it, you might want to consider the impact of removing the password. Other people could access your computer without your knowing about it. The last thing you want is your mom knowing you’re looking for a weight loss product on Ebay. If this isn’t a problem, then here’s what you need to do. 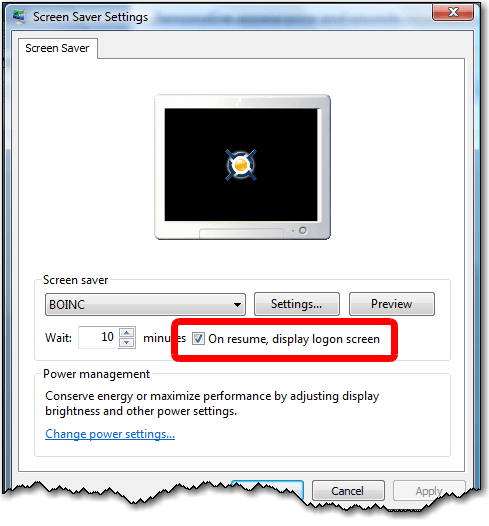 Click on the check box labelled “On resume, display logon screen” so that the tick disappears. Click on OK to save the changes. ← Previous Previous post: Can I watch videos on Ubuntu? Next → Next post: Can you recommend an MP3 player I can use in my car?